I’ve been meaning to comment for some time that, for me, one of the most useful magazines in the field of online education and virtual worlds is Jim (James L.) Morrison’s Innovate. As Editor-in-Chief, Morrison (pictured right), Professor Emeritus of Educational Leadership, University of North Carolina, publishes the online education journal for the Fischler School of Education and Human Services at Nova Southeastern University. Published bimonthly as a public service it is sponsored, in part, by Microsoft. The August/September issue includes articles on the role of virtual realities in (and as) the classroom. In one article, Ulrich Rauch, Marvin Cohodas, and Tim Wang describe the Arts Metaverse, a virtual learning environment for the three-dimensional reconstruction of important archeological artifacts and sites, allowing students access to places and works they would not otherwise be able to experience. In addition, students may create reconstructions as well as visiting particular sites. Embracing the principle that engaging students in the construction of a virtual teaching and learning environment can create a participative learning experience, the Arts Metaverse Project aims to enable students and academics to become joint researchers in creating and sharing knowledge beyond the walls of the university. Two other articles describe efforts to create learning environments in Second Life. Mary Anne Clark, of Texas Wesleyan University, describes the creation of Genome Island, a virtual laboratory complex, supported by the Biology Department of TWU and constructed for teaching genetics to university undergraduates. Her initial trials of teaching in this virtual world, she said, had indicated that virtual worlds offered a learning environment that combined active engagement with the convenience of online access. Meanwhile Anne Hewitt (pictured lower right), Associate Professor of Healthcare Administration, Seton Hall University, Susan Spencer, Danielle Mirliss, and Riad Twal reported on a collaborative initiative to create a virtual simulation exercise focused on key competencies for students in a Master of Healthcare Administration program. The exercise they designed provides a previously unavailable virtual counterpart to the tabletop exercises traditionally used to teach emergency preparedness, allowing online students to gain important hands-on experience and opportunities for interaction. 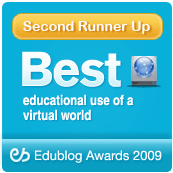 Hewitt et al reported that creating a virtual learning experience using “Play2Train’s Second Life environment” satisfied a need for an interactive simulation that allowed for discovery, critical thinking, and analytical skills, all goals of a graduate MHA course. However, she said, preparing the adult graduate students required a team of committed professionals, significant lead time, specially developed support materials and guided practice activities, and a scenario development process that integrated project goals and outcomes. She added, “our experience could be replicated in many disciplines that use scenario-based learning but cautioned that the decision to develop and use a simulation delivered in a virtual world should be based on several factors. “First, the instructors must ensure that the course content is aligned with the choice of scenario,” she said. “Instructional design of the scenario should directly facilitate attainment of the desired learning outcomes through appropriate activities. In addition to the learning objectives, both faculty members and students must be allowed adequate time to develop the necessary technical skills to participate successfully in the scenario. The articles referred to above, along with a number of other interesting education articles, make this August-September issue of Innovate, worth reading even though it has been out for some weeks now. Coupled with the two other special issues — on Academics in Second Life, in December, and on Virtual Worlds and Simulations, in June— the online magazine paints a picture of virtual world education which is compelling.